Let me just confess this: i am hopelessly white. I enjoy electronic music (moreso than any other Minion), but i just don't get rap. I mean, i like the sound collage that is hip-hop, but i find the toneless rhymes layered overtop to be, well, annoying. As such, i really like instrumental hip-hop, but that's a pretty obscure genre. I mention all of this because, no matter what people have told you, The Grace Period are a hip-hop act. An instrumental hip-hop act, in that there is no rapper. Obvious comparision points are DJ Shadow, some of the funkier work of Tleilaxu, or US3. 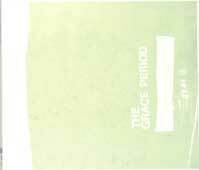 This is to say that the music of The Grace Period is defined by drum / rhythm loops taken from older recordings. Over this The Grace Period layer funny vocal samples (apparently, they took a tape recorder to a party and recorded their friends), interesting guitar pieces, spacey keyboard bits, and, well, all kinds of stuff. Quite honestly, i find this album to be fascinating -- there is so much going on, so much to listen to. Apparently there are two people in this act, Chris Ott (who used to write for the anti-Malimus conglomerate Pitchfork) and somebody named "Julie". I don't know who is responsible for constructing the rhythm loops that make up the core of the songs, but that person has some real talent. The drum loops are what really make the album. Perhaps the prime example of what The Grace Period are capable of comes on Et In Arcadia Ego, midway through the album. This song starts with an ethereal keyboard chime looped, and then huge frenetic drum beats thunder in. Deeply buried in the mix is a female voice speaking in French. That's pretty much the song, and i know that it doesn't sound like much when you read it, but this tune captures the sheer intimidating majesty of life in a dramatic way that reminds me of What Does Your Soul Look Like?, DJ Shadow's masterpiece in four parts. It's great listening -- funky, yet relaxing. It portrays a lot of emotion by building up a mass of sound from simple elements. The sampled and looped drum parts seem alive in a way that a drum machine doesn't, and that is part of what i like about this band. I like that they sound sample-based, but are entirely lacking the cold mechanical feel that much electronica has. It's the drum loops that do this i know -- somebody really played those drums at some point, and The Grace Period are simply cutting a small piece of a drum performance and re-structuring it. I say simply, but i suspect that this music is more difficult than it at first seems. Otherwise, well, more people would be doing it. Moving on, although all of the songs are pretty good, there is another stunning track on the album. I Can See My Breath also stands out above the crowd. Here, The Grace Period combine postively head-on "beat the tar out of the drum kit" loops with echoey guitar. Again, a simple combination that really works. I like the juxtaposition of the spacey-ness of the guitar with the concrete reality of the intense drumming. What strikes me most about The Grace Period is the simplistic combination of the music. That is, there are two loops playing against one another, and some samples strewn over the top. It's not a lot of "content", but it creates a rich, full sound. What it is, really, is collage, pure and simple, and that's why i call it instrumental hip-hop.